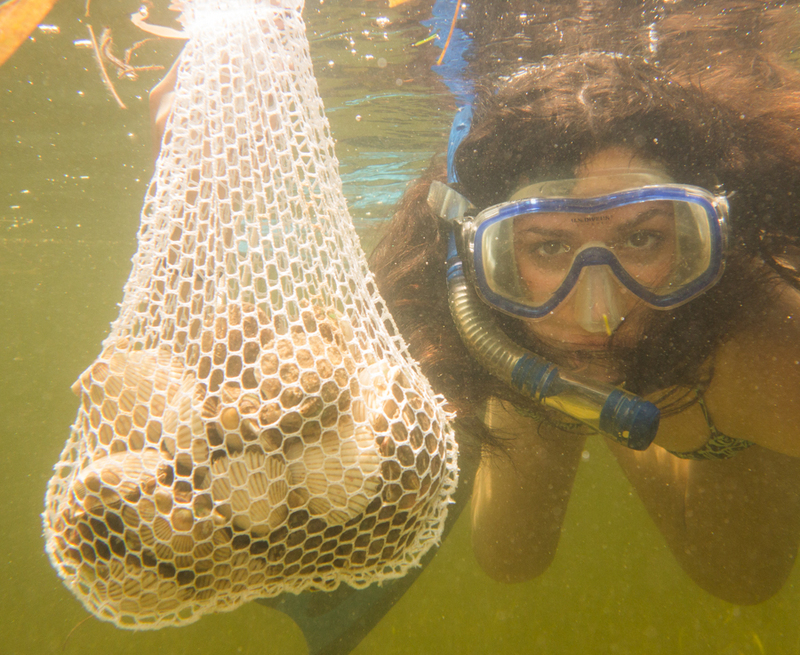 In last month’s Big Bend Action Spotter, I wrote about getting away from the scalloping multitudes by fishing in places likely less “infested”. This month, let’s consider coexistence! I know lots of anglers who simply give up saltwater fishing in the Gulf of Mexico during Florida’s recreational bay scallop season, which ends this month and includes the busy Labor Day weekend. Many head to the Atlantic side of the state, even to freshwater rivers and lakes. But there are options and complete abandonment of the Gulf isn’t necessarily one of them. 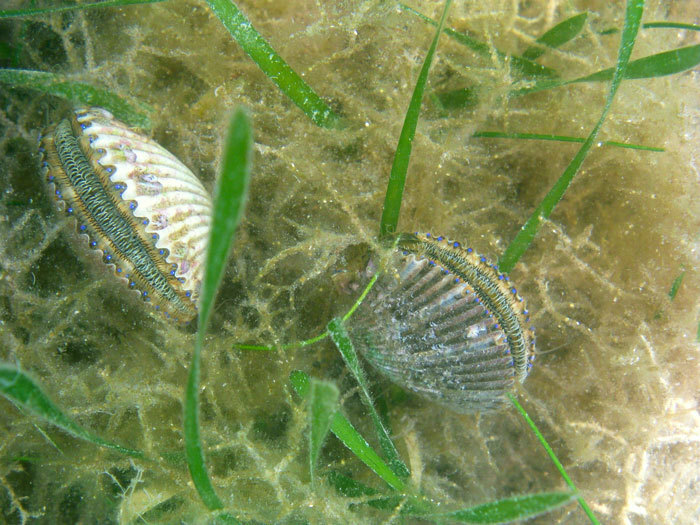 Know that for the most part, scalloping goes on in water that’s three to ten feet deep. At the deep end of that range, there are scallops, but only hardy divers with big lungs can get there. Deeper than that, it’s pretty much snorkeler-free. Sea grass flats, especially our big one that starts just north of Anclote Key off Tarpon Springs and ends at St. Marks, can run to the thirty-foot depths, depending on water clarity. And just like the three-foot flats, the deeper ones are peppered with patches of sand and live spongy bottom. Add to that some wrecks, rocky outcrops and ledges, you’ll have a good mental image of what the Gulf’s floor look like. It’s those scattered bottom structures in the ten-foot-plus depths that should be of interest to fin fishermen who want to avoid the last of the 2017 season of “scallop madness”. All summer long, vast numbers of baitfish and yummy crustaceans have been flourishing, all while hiding from predators who lay in wait along the edges of sand patches, behind rocks, under ledges and among wreckage. And, depending on late summer rains or storms that might cloud the waters, it should be clear enough away from shore for you to visually investigate the bottom. Spotted seatrout, flounder, black sea bass, red grouper or mackerel are all good targets and you might even be able to bring home a gag grouper–if you’re in Dixie, Levy, Citrus or Hernando county state waters. From Hernando County, you’ll have to run past the scallopers to get to the deep flats. Reaching the end of the Bayport and Hernando Beach channels drop you into water that’s too deep for the average snorkeler to access. Just beyond the three-mile limit, you’ll start to see good patchy bottom, as well as some big rocks. If you depart Crystal River’s main channel, head northwest from Marker #1A towards the Duke Power channel and look for the “Hump”, a shallow rise in the bottom. It’s a good spot to try for trout before you head farther west to the two Crystal Artificial Reefs. They lie just south of the point where the Duke Power channel takes a turn towards the old Cross Florida Barge Canal channel. These “Fish Havens” are decades old, but still offer some relief and potential for reef fish and pelagics. Cedar Key isn’t necessarily a scalloping destination, but you can find some deep, clear water there. I’d recommend you head south out the Main Ship Channel and drift the grassy top of Seahorse Reef for trout. Then, if you want deeper water or more structure than turtle grass, head west to the live bottom near the Kingfish Hole. Staying south of the Cedar Keys archipelago will keep you in cleaner water than heading north towards the mouth of the Suwannee River, where the river’s outflow can muddle things. The Suwannee’s darker waters will eventually dissipate and clear up between Horseshoe Beach and the Pepperfish Keys. The water will stay gin-clear beyond Steinhatchee and Keaton Beach in Taylor County. After navigating through the scallopers from any of those ports, you’ll be able to find lots of good, active grass flats, as well as lots of unmarked rock piles, some only as big as a small boat. You’ll find plenty of trout over the grass, and if you find your next “super secret rock pile” expect red grouper or big flounder to be the winning catch that day. Water clarity to the south and southeast of St. Marks can be iffy. It all depends on recent rains and the dark water flow from the St. Marks, Aucilla and Econfina rivers as well as the many creeks that flow into the Gulf along the Jefferson and Wakulla county coastline. If the water’s clear, there will be lush grass beds and a good trout bite. If you’re looking for reef fish or pelagics that chase bait over rough bottom, search northern Apalachee Bay. It’s the boundary of Florida’s natural Karst geology so there’s plenty of natural structure in the 12 to 20-foot depths. There’s no structure much better than ledges, rocks and small seeping springs when it comes to successful fishing—and there are plenty of them, some undiscovered, there. Moving to deeper flats and the potential of inshore species as well as reef predators and pelagics, you’ll need to change your tactics and tackle. I suggest 3/8 to 1/2-ounce jigs to get to the bottom, and I’d put my money on chartreuse as a good color. Pair jig heads with a D.O.A. 4-inch Shad swimbait (Glow, with a chartreuse tail, is my favorite.) And consider using spinning combos larger than your usual 2500-4000 class gear in these deeper waters. If a grouper or a king mackerel unexpectedly comes to dinner, you’ll be glad you brought your 5000-class tackle! Snook On The Upper Big Bend? You Bet–Provided We Have a Warm Winter! Warmer winters mean the habitat for snook has moved north, into Levy and Dixie counties. Snook are probably the most fun and abundant gamefish in Florida. They run, they jump, and if you want to keep one for dinner during open season, they’re delicious to eat. However, they’re also highly susceptible to cold water temperatures and are some of the first fish to be found floating dead after a hard winter freeze. Warm winters in recent years have allowed snook to migrate north from Pinellas and Pasco counties (Tarpon Springs’ Anclote Key was the northern edge of their range for many years.) Now, with our recent warm winters, snook are regularly being caught well north of the Withlacoochee River in Waccasassa Bay and even as far north at Suwannee’s Salt Creek. Snook are ambush feeders, and prey on small fish (mullet, pinfish and sardines) as well as crustaceans (crabs and shrimp). They will also readily attack artificial lures like the D.O.A. shrimp or slow-sinking MirrOlure Catch 2000s. Rigging is important, with stealthy knots (Homer Rhode or Uni Knots work well) and tough, invisible fluorocarbon leader (24-30#) a “must”. An interesting fact about snook is that they are picky about their prey. If you’re using live fish for bait, don’t rig them like you do for redfish (through the back or tail) but hook them through their lips. Snook attack from behind! And they prefer fast-moving water, especially when it’s washing baits off shallow flats or bars into deeper troughs. In 2015/2016, Gulf Snook “season” runs from September 1, 2015 to February 29, 2016 and from May 1 to August 31, 2016. While you’re allowed to keep one snook per day, anglers are urged to have fun and release fish they catch. Just remember–one cold winter and the snook will again head south and away from our Big Bend waters! Blowfish, Smoothback Puffer Lagocephalus inermis, Family:Tetrodontidae (Puffers) Commonly known as smooth-backed blowfish. Covered in tiny, sandpaper spines. Olive green to dark grey above with silvery yellow sides, belly white. Smooth sides, rough belly. Eyes are large and high on the head. Young fish have 3-4 brown patches and/or spots on the back. Grows up to 3 ft in length. Puff up to 2 times normal size when on the defensive. Two front teeth are fused to cut and crush. Feeds on foods like bits of worm, small shrimp, crabs, clams, etc. Found in shallow bay areas during summer, wintering in deeper waters in the south. During the past week, my clients and I landed over a dozen of these fish, most in the 16-20-inch size range. They’re ferocious, attacking jigs, subsurface plugs and even topwater lures. And there was no particular structure involved. We caught them from one to six feet of water, over rocks and grass and even mud bottom. I’m curious if my readers have experienced any catches of these pests. They’re not the usual “porcupine blowfish” that take chunks out of soft baits and I’m concerned that people will try to eat them. There’s a danger of saxitoxin poisoning from them, so don’t take a chance. In fact, it’s illegal to keep puffers in some SE Florida counties. Freezing or cooking will not kill this toxin, and it may kill you!